EMCEL Slimline filter units are specifically designed for applications where a good level of filtration is needed but where space, and in particular filter depth, restrictions apply. EMCEL Slimline units are available in two standard formats or can be manufactured to suit customer requirements. 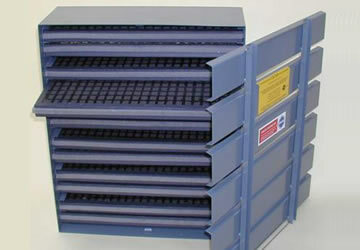 Activated Carbon cells arranged in V-formation housed in a rigid steel unit. The carbon cells are easily removed and changed via the front access door. Replacement cells are readily available from EMCEL Filters. This option offers a competitively priced unit featuring Emcel activated carbon cells sealed within a galvanised housing. The whole unit is completely disposable.